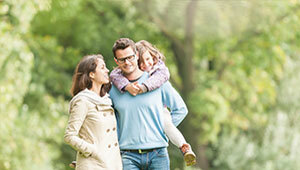 We are developing a new non-invasive glucose monitor that will help you take control of your life. (Caution: GlucoWise is still under development and not available for public testing. If you are interested please use the "Get involved" signup form on this page. Due to the overwhelming demand we are unable to respond to individual emails - we are focused on getting the device to the market quickly). 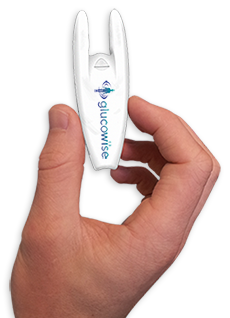 Glucowise™ is a non-invasive, 100% pain-free device that makes traditional blood sampling a thing of the past. Our unique sensor technology will allow you to monitor blood glucose levels without the need to pierce your skin. 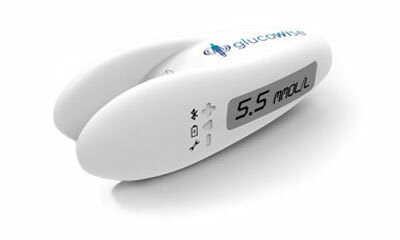 Simple yet highly reliable, Glucowise™ will exceed industry standards for self-monitoring blood glucose accuracy. You will be able to sample as often as you like and wherever you like, ensuring you avoid sudden hypoglycemic events. Our App and Smart Cloud technology delivers personalised advice and alerts, helping you to fully manage your condition. Intelligent analytics will use your current and historical data to calculate and forecast immediate trends in your blood glucose levels, allowing you to adjust your food or medication intake according to your activities or how you are feeling. Glucowise™ will offer unlimited testing without the need for costly consumables, so you can test as often as you like without having to worry about the cost or pain. The compact design will offer you high levels of privacy. It will take no more than 10 seconds to provide a simple, fast and highly discrete testing experience – anytime, anywhere. The data can then sent wirelessly and securely to your smartphone or tablet. There are many situations whereby conventional testing is challenging. Often people with diabetes will unnecessarily expose themselves to dangerous levels of glucose rather than take the risk of having a sudden hypoglycemic event. Long-term exposure to high blood sugar levels can cause serious long-term health issues. Glucowise™ minimises this problem by allowing quick, non-invasive, portable and continuous monitoring so you can regain control of your insulin dosing and glucose levels throughout the day and night. 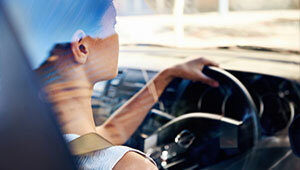 Imagine having a sudden hypoglycemic event whilst driving. With Glucowise™ you will be able to avoid situations where you are unable to test before driving or when you are stuck in traffic jams and can not get off the road. Our portable sensor means that you will be able to safely monitor your glucose levels in almost any situation and be alerted to potential danger. As a person with diabetes, it is important to exercise but often the fear of rapid glucose consumption is a deterrent. Glucowise™ will allow you to enjoy exercise without the worry as you can continuously test both before and during sport. 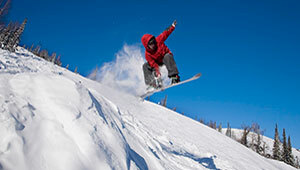 We are testing the device to ensure it works effectively in a wide range of climates, humidities and temperatures so you are free to snowboard or jog as much as you please. As a parent or carer it is tempting to under-dose your child or patient with insulin when they will be away from you to avoid hypoglycemia. 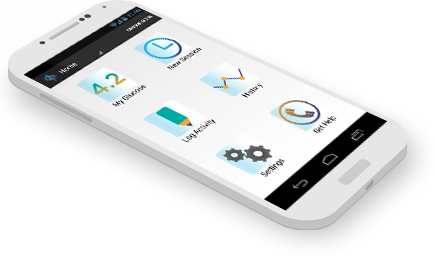 Glucowise™ will be able to send readings back to your mobile app even when you are not present. You can be constantly aware of your child or patient’s glucose levels and can ensure appropriate actions can be taken. One of the most dangerous times for people with diabetes is at night. Traditional testing is not convenient and can get in the way of a good night’s sleep. Glucowise™ could be set to remind you when to test both during the day and night. Being so rapid, painless and simple, you will be back in the land of dreams before you even know it. This non-invasive, wireless device will take an accurate blood glucose reading every few seconds – as often as the user requires. It is positioned to gently squeeze the skin between the thumb and forefinger or the earlobe to measure blood glucose levels. The device then displays the reading in real-time on the screen. An easy to use, all-in-one support tool to help you track your day-to-day glucose levels. The information collected by the monitor can be uploaded wirelessly to the mobile app, allowing you to track your readings over time and merge it with other information impacting your blood glucose levels. Data collected will ultimately integrate with other databases and mobile health apps and platforms, with the appropriate permissions. Our cloud-based data management system will allow you to store historical Glucowise™ data and consolidate it with other data sources. If you do not have the Glucowise™ mobile app, your information can still be uploaded directly to our smart cloud through any computer USB port. Over 90% of people with diabetes would welcome continuous blood glucose monitoring whilst driving and during sports or other physical activity. Over 90% of people with diabetes use a blood glucose monitor with test strips, typically costing over £800 per year. 56% of people with diabetes would test themselves between 8-10 times per day if testing was painless and convenient.  This is compared to just 18.3% who are already testing themselves that many times. Does GlucoWise™ measure blood glucose levels? Yes. 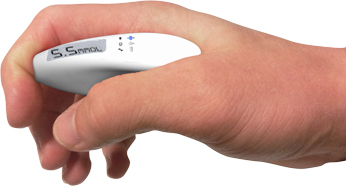 Our technology enables the blood glucose concentration to be measured at the capillary level. This means that GlucoWise™ is more accurate than other non-invasive methods which measure the amount of glucose at the level of the skin, where there is limited blood present, or using other body fluids such as interstitial fluid. How does GlucoWise™ measure my blood glucose levels without taking any blood? The glucose levels are extracted by a non-invasive technique which transmits low-power radio waves through a section of the human body, such as the area between the thumb and forefinger or the earlobe. These areas have adequate blood supply and are thin enough for waves to pass through the tissue. These signals are then received by a sensor on the opposite side of the GlucoWise device, where the data about the characteristics of the blood within the flesh are collected and analysed. How is the GlucoWise™ technology different from the competition? 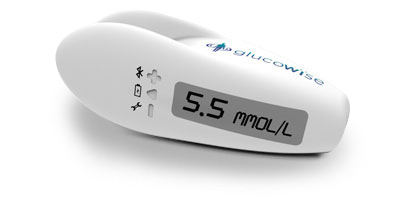 GlucoWise™ utilised two unique technologies to achieve unprecedented accuracy in non-invasive glucose measurements. First, we utilise high-frequency radio waves around the 65 GHz range. These waves are large enough to allow penetration through the tissue, yet simultaneously small enough to provide sufficient resolution of the blood regions inside the tissue. Second, our sensors have integrated nano-composite films which temporarily make the skin transparent to the radio waves when a measurement is initiated. This ensures consistent readings across all people independent of age, or skin type and colour. What is the current status? When will it be available to order? GlucoWise™ is currently in development and will be available to purchase once clinical trials are completed. The highest security measures are being integrated into the GlucoWise™ system to ensure that each user’s data is completely safe and never shared with third parties unless explicitly allowed. To protect the glucose data it is digitally encrypted and then transmitted via Bluetooth 4.0 technology to a smartphone or tablet. It can then be automatically uploaded to a secure database online or, if the user does not have a smartphone, it can be transferred to a computer via a USB port. Both the associated app and database are password protected so the data can only be accessed by the user, however the user can choose to allow selected data to be shared with medical professionals, family or friends. How will the accuracy of the device be tested? This process will vary depending on the country in which the device is purchased. In Europe the device will be regulated as a Class IIa Medical Device. According to the Medical Device Definitions (93/42/EEC as revised by 2007/47/EC) the device will conform to the relevant essential requirements of Annex I of the Medical Device Definitions for safety and performance-related device features. In addition, all clinical trials will need to conform to European Clinical Trials Directive (2001/20/EC). The tests will fully evaluate the safety aspects that would be involved with long-term usage of the device. Glucowise™ is an innovative new product from MediWise, a medtech knowledge-driven company that empowers individuals to take control of their health. Founded by a team of entrepreneurial individuals in London in 2010, MediWise is developing breakthrough solutions targeted at the big health problems. The team includes award winning scientists with proven track record in wireless devices, implantable and wearable sensors, physics, nanotechnology, imaging and intelligent algorithms. It also includes award-winning entrepreneurs and experienced executives specialising in medical devices commercialisation, business and product development.